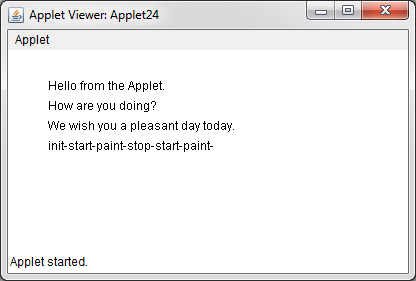 In this article, we are going to understand how to print a message in the applet window by implementing a method paint() of the Applet class. Within the method paint() we will call drawString() method to print a text message in the applet window. when the paint() method is invoked? When the applet window is brought up on the screen for the first time. When the applet window is brought up on the screen from a minimized state, this leads the redrawing of the applet window and hence paint() method is automatically called. When the applet window is stretched to a new size, this leads to redrawing of applet window to a new size and hence paint() method is automatically called. The method paint() gives us an access to an object of Graphics class type in our applet code. Using the object of Graphics class, we can call drawString() method of Graphics class to write a text message in the applet window. The method drawString() takes a String which will be printed on applet window, starting from left-top corner at the coordinates x and y. Writing a message on applet window. In the upcoming code, we are implementing paint() method in our applet class. Within the paint() method, drawString() method is called to write a message in the applet window. Where Applet24.java is the name of java file that contains the code of an applet. Method init() was the first method to be called in an applet's life. Next, start() method was automatically called by init() method. 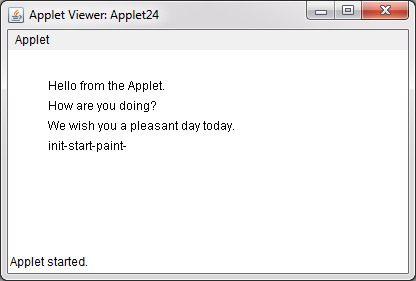 Next, paint() method was automatically called to display the applet window the user and within the paint() method, drawString() method is called a few times to write messages in the applet window. Method stop() method was called when the applet window was minimized. Next, start() method was called right after applet window is brought up again to restart its execution.